Muse have released a video for their new track Dig Down. 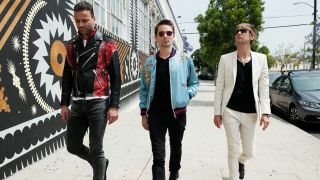 It’s the first material from Matt Bellamy, Chris Wolstenholme and Dominic Howard since their seventh album Drones, and comes just days after the band teased a video showing work behind-the-scenes on the promo. Drake says: “When I heard this song, I knew I wanted to do an action-packed narrative. I’d heard about Lauren a year or so ago, I read her story and she gave me personal inspiration so I’d always kept her in mind to shoot with one day. Muse are also gearing up for a North American tour with special guests Thirty Seconds To Mars and Pvris which will get underway later this month. They’ll then return to Europe for a handful of shows, including headline sets at the Reading and Leeds festivals in August. Find a full list of Muse’s tour dates below.